All her life, Valancy Stirling has lived on a quiet street in an ugly little house in northern Ontario, Canada and never dared to contradict her domineering mother and unforgiving aunt. The deeply squelching kind of small town life L.M. Montgomery describes for Valancy is one that I recognize as Canadian, but of course is universal. To escape her life of quiet desperation, Valancy has created a world apart for herself called “The Blue Castle”. This private realm in which things are beautiful and she has value has changed and grown with her since childhood and now, at the age of 29, it is her intellectual and emotional sanctuary. When Valancy receives a shocking letter, she takes the reins of her life, doing what she wants to, saying what she feels, and refusing to bend any longer to her repressive existence. Given the setting and early twentieth century time period, this rebellion consists of changing churches, refusing to participate in her maddening family dynamics, and becoming employed. Her so-called loved ones are the kind of people who feel Valancy’s life is careening out of control because she said “darn” and therefore almost swore, so when she takes is a step further and marries a local man of poor, but unproven, reputation, her family is so scandalized that they fear for her sanity and disown her. Delightfully, Valancy soon discovers more fulfillment and adventure than she ever thought possible, including someone to love and the modest, true, real-world version of her Blue Castle. L.M. Montgomery is famous for her Anne of Green Gables, Avonlea, and Emily of New Moon books. I am an Anne devotee and many of the lovely elements of those stories are present in this sweet, adult romance. Montgomery is a wonderfully evocative writer with a light touch for setting a scene and painting a landscape. So much of this story is about Valancy reveling in her environment and simple day-to-day activities, but Montgomery portrays it all with lyrical, measured prose. The window to Valancy’s world is just captivating. As someone from Ontario, I have been to Muskoka where Valancy lives. It is incredibly beautiful and this book made me terribly homesick for its geography. Being Canadian also gave me a layer of familiarity with the characters. Ours can be a severely Protestant culture, leery of being overly enthusiastic, making a fuss or drawing attention to oneself, and with an absolute horror of self-confidence and pride. Shown in this context, Valancy’s quiet, incandescent joy in her new life, as well as her deep-seated insecurities, felt very real. 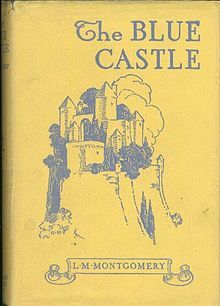 I have a list of favourite and classic romances that The Blue Castle has been added to. When I first dove into this genre, the classics were all around for me to find and for people to recommend. As I read on, the flood of truly great and new-to-me romances has slowed to a trickle. Discovering a book like The Blue Castle is such a treat. Links to my other reviews can be found on my complete reading list of books sorted by author or Author Commentary & The Tallies Shameful.